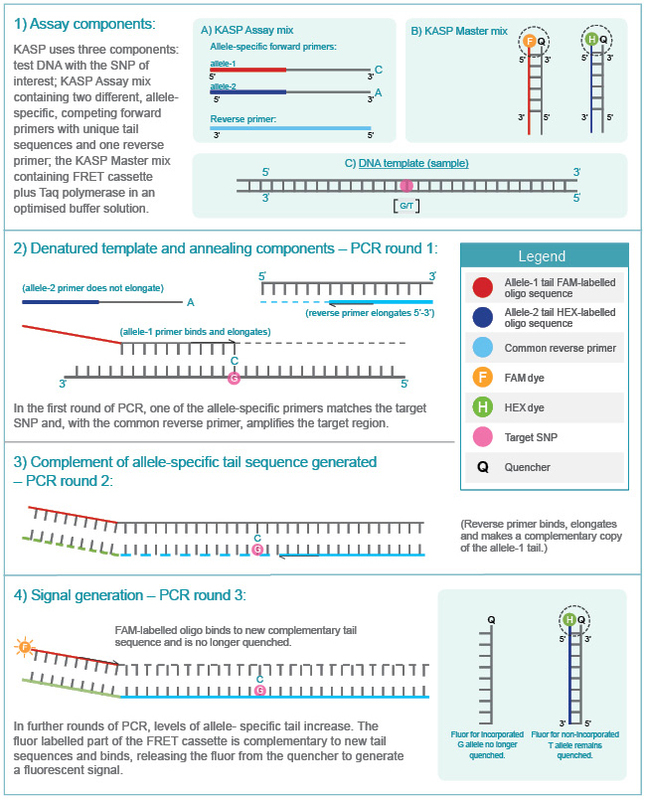 Based on competitive allele-specific PCR and enables bi-allelic scoring of SNPs and In/Dels. KASP™ genotyping assays are based on competitive allele-specific PCR and enable bi-allelic scoring of single nucleotide polymorphisms (SNPs) and insertions and deletions (Indels) at specific loci. 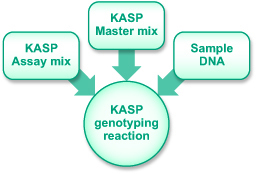 The SNP-specific KASP Assay mix and the universal KASP Master mix are added to DNA samples, a thermal cycling reaction is then performed, followed by an end-point fluorescent read. The KASP Assay mix contains three assay-specific non-labelled oligos: two allele-specific forward primers and one common reverse primer. The allele-specific primers each harbour a unique tail sequence that corresponds with a universal FRET (fluorescence resonant energy transfer) cassette; one labelled with FAM™ dye and the other with HEX™ dye. The KASP Master mix contains the universal FRET cassettes, ROX™ passive reference dye, taq polymerase, free nucleotides and MgCl2 in an optimised buffer solution. During thermal cycling, the relevant allele-specific primer binds to the template and elongates, thus attaching the tail sequence to the newly synthesised strand. The complement of the allele-specific tail sequence is then generated during subsequent rounds of PCR, enabling the FRET cassette to bind to the DNA. The FRET cassette is no longer quenched and emits fluorescence. Bi-allelic discrimination is achieved through the competitive binding of the two allele-specific forward primers. If the genotype at a given SNP is homozygous, only one of the two possible fluorescent signals will be generated. If the genotype is heterozygous, a mixed fluorescent signal will be generated.